One can never say "Sound Blaster" without Creative in the same breath - reason enough then for the Singapore-founded company to take its best known product and make it even better. Described as the most significant launch by Creative in four years, the company has compressed all the best elements of the Sound Blaster into a tiny device that can go everywhere with you. The latest, little baby is dubbed the X-Fi Go! and looks, feels and even functions like a flash-drive. The difference is, when it's plugged in, be prepared for a blast. With the 3D sound technology on board, a gamer should enjoy realistic surround sound and the advantage of even being able to hear the position of opponents though they can't be seen. Other useful additions found in the X-Fi Go! for gamers is OpenAL which bypasses the operating system in Windows XP and Vista for better audio output and Creative ALchemy which restores the sound or surround sound of games that suffer audio losses when played on Vista. This device also offers space so gamers can upload their gaming profiles and other essential information with Read/Write protection, so scores can be safely stored and shared until the next kill. Of course those with less adventurous lives can still take advantage of the X-Fi Go! with its Voice Morphing technology well-suited for those who favour Second Life or the Karaoke Player for a sing-along with pitch shifter and reverb to make it all sound a little better. The X-Fi Go! contains audio technology such as the Creative X-Fi Crystalizer which uses audio algorithms to selectively restore the highs and lows from instruments and vocals that are usually diminished during the compression processes. There's also realistic, surround sound thanks to the X-Fi CMSS 3D and EAX Advanced HD audio technology on board. Those who prefer an even richer sound experience may instead prefer the other plug and play option from Creative, the new Sound Blaster X-Fi Notebook Express sound card. It took two years of research to come up with this simple sound card which can be used in a 34 or 54 ExpressCard slot. The receivers work up to a distance of 30 metres and since users can match the card with up to four receivers and speakers that can be placed in different parts of the home, it's easy to imagine the New York Philharmonic or U2 playing in your home. "The Creative Sound Blaster X-Fi Notebook and Creative Wireless Receiver were designed to dramatically improve the sound quality of all of the music, movies and games on your notebook PC and play it wirelessly anywhere in your home" said Steve Erickson, Vice President and General Manager of Audio for Creative Labs Inc. While it does seem appealing to be able to enjoy audio from a laptop streamed to any size and brand of speakers with no delays or dropouts, the real magic should be in the sound. As Craig McHugh, President and COO of Creative Labs Inc. rightly pointed out to the media gathered for news of the latest Creative product release, it's rather meaningless to have high-end speakers playing sound that's been so compressed that the artistry of the studios and performer is almost lost. Creative and the X-Fi said McHugh "is not just improving electronics, we are actually improving the music." Stealing away from the hum of the media blitz of the new product launch, I decided to test the Creative claim with a good listen-in to the X-Fi in the quiet of the public showroom at Creative HQ. Switching between X-Fi and standard stereo, a perceptible difference could be heard in the dialogue with a more direct sound. The swish of a sword being drawn and the drop of water into a cup couldn't be missed on both platforms. But the ringing from steel on steel was more distinct and the echo from a drop of water falling into a cup wasn't lost when channelled through the X-Fi sound card. 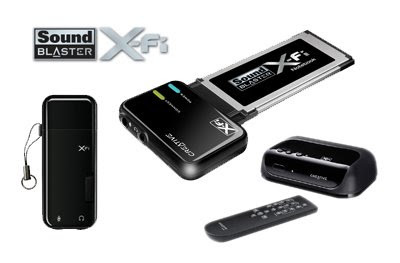 What the Creative X-Fi sound card does is to upscale and restore the compressed sound from an MP3 or CD to a full 24 bit. So it didn't matter whether the WW2 classic "You Belong to Me" was being performed by 1940's favourite Patti Page or 2000 rocker Tori Amos. The orchestration and ambient atmosphere in delivering the piece was clear in the clean, crisp sound. While Creative wins hands-down in the audio department, it needs more work in the visual department. The virtual audio controller that's placed in the PC is in serious need of a make-over. The colours and flat layout doesn't do justice to a quality audio product. Perhaps some software expert company like Apple or Microsoft should buy over Creative or collaborate to combine the best of both worlds. No way man! Creative should remain on its on! Cool, it's good that Creative is still getting some press coverage. Well, CNA reporting about Creative is nothing to be surprised of. But great review by CNA nevertheless, which really emphasise how Creative is still a leader in sound technology. Pity the lack of development or breakthrough in other areas.